Cook Pork according to recipe for Char Siu buns in advance. Dice up 1 cup of the tenderloin for rice. Set Aside. Heat a deep wok or saute pan over medium high heat and sesame oil. Add diced onion and cook for 3-5 minutes until translucent and softened. Add the rice and let it cook for another 3 minutes or so. Push the rice to the outer rim of the pan to create a hole in the center. in a separate bowl, crack and whisk the eggs together. Then pour the mixture into the hole in the pan. Let them cook and then scramble, slowly mixing the eggs into the rice. Add the tamari, fried rice seasoning, and 2 tbsp of water to the rice. Mix well to blend flavors. Add frozen peas and carrots along with the diced pork pieces. Allow to cook for 3-5 minutes until everything is warmed. On Tuesday I featured some delicious Char Siu (Chinese Barbecue) Pork Buns. They highlighted sticky, crispy, and tender pork tenderloin from Recipe Tin Eats. Well, today I’m showing you how to use up all the leftover marinated pork. 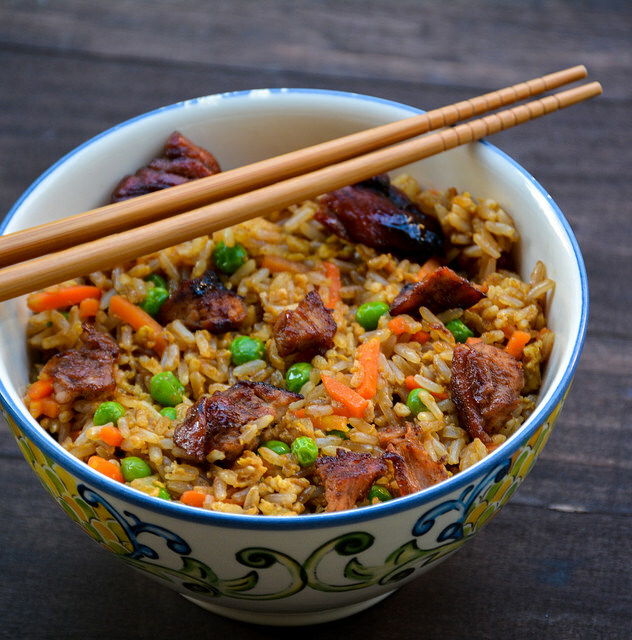 It’s as easy as three words, Pork Fried Rice. The barbecue marinade elevates the pork in this dish and gives it that authentic takeout flavor. I love that you’re getting two meals out of the one piece of pork tenderloin. For those of you who have not made fried rice before, I’m here to share the secret. It’s using COLD rice. 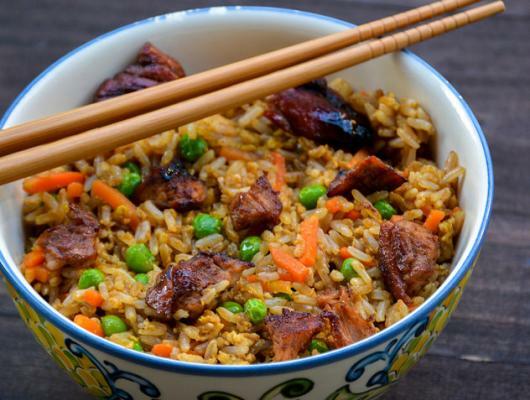 So you will need to make your rice a day or a few hours in advance in order to yield the flavor and texture you want for perfect fried rice. I used brown Jasmine rice I got from the Asian supermarket on my visit, but just plain white rice will do. I just love Jasmine rice and how it cooks when reheating in a dish like this. According to Sommeliers a Riesling is the wine to pair with your Chinese food. So, just make a heaping bowl as your main course and a nice big glass of Riesling to wash it down. Now you’ve got all the makings for a fakeout takeout meal. It’s sure to be delicious and a little bit better on that waistline without all the hidden sodium etc.